New version (1.3.1a) of Simple LP Solver is available for download. Changes? The Simple LP Solver is a lightweight application that provides Simplex and Revised Simplex problem solvers with degeneration check for Primal and Dual problems. The software uses both single phase and two phase techniques depending on type of the constraints. If the all constraints are “<=”, the single phase technique is applied while Two Phase technique is automatically used for “=” and “>=” constraints. It has a simple graphical user interface with all menus and toolbar on the upper part and status-information bar on the lower part. 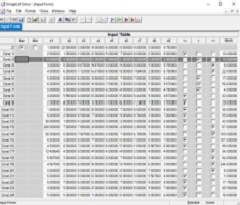 There methods for problem loading are provided; the Input Table function allows entering the required input parameters (a maximum of 250 decision variables and 63,900 constraints) while Input from File function loads problems from comma separated text (CVS) files. On the other hand, the Load Table from File function loads problems from comma separated text (CVS) files to the Input Form. Save Table to File function writes problems from the Input Form to comma separated text (CVS) files. The delimiter for CVS can be selected. The Solver can check coefficent of decision variables and constraints if they are all zero. A constraint with all coefficients are zero is eliminated. Input can be checked for redundant constraints, if any, it is eliminated. The Solver also check the negative RHS values and converts them to positive by multiplying by -1 and changing the equality sign. Simple LP Solver features a simple text editor that handles both rich edit (RTF) and plain text (TXT) formats. Output of the Solver is shown in the plain text format. If needed, additional comments and text can be added to the output. The output is saved to a file in the plain text format but can be saved as rtf file. 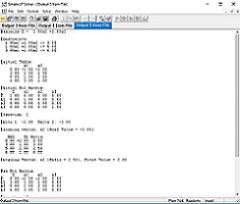 The editor can also be used any plain or RTF file. The files can be printed. The program also supports drag and drop feature. A file can be opened by dropping a document icon on the application icon. The size of the problem theoretically depends on the memory allocated to the program by the computer. Normally maximum of 2GB memory is allocated for a program. This limits the total array size to 128M; row count x column count (for the revised simplex methodology, constraint counts x constraints count while decision variables counts + >= constraints counts x constraints count for simplex methodology). Large inputs may take significant time (10s of minutes) even for loading the input from a file. Values can be integer and floating point numbers in the range of 2.3E-308 to 1.7E+308. The floating numbers have 15 digit precision although 2 decimal digits are displayed. The application requires Microsoft Windows XP SP2 or later operating systems running on systems with x86 CPUs and at least 1 GB RAM. SimpleLPsolver.exe is a portable application and can run anywhere. Help file; SimpleLPsolver.chm should be in the same directory with the executable file. Configuration and history files will be created in the same directory with the executable.